Letting your mind wander allows you to be introspective, and to think in abstract ways most other animals cannot. And yet rats possess the same brain structures we use for introspection — which suggests deeper evolutionary roots for introspection and, by extension, consciousness itself. The default mode network, or DMN, is a network in the brain that humans use exclusively for zoning out. The DMN is one of about ten brain networks that fire up when a person's mind is at rest, and it becomes particularly active when the person is instructed to stop paying attention and just let their mind wander. Even more importantly, the DMN stops functioning the moment a person is given some other task to do. In humans, the DMN appears to be all about introspection, which in turn implies a link to more abstract modes of thought, which is considered a hallmark of human consciousness. Previous research has indicated that monkeys also have special areas of their brains that fire up when they're not otherwise engaged in a task. These monkey brain networks look a lot like the DMN, which makes sense — lots of studies have shown that primates possess much the same cognitive hardware as we do, albeit in a somewhat more primitive form. But now researchers at the US National Institute on Drug Abuse have discovered that a far more distant evolutionary cousin also possesses a brain network like the DMN: the common rat. 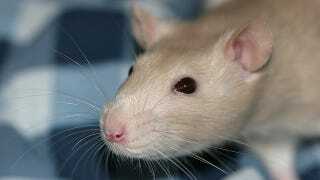 The researchers mildly sedated 16 rats and examined their brains with an MRI. By comparing the rats' brains in a resting state with their state after a mild electrical shock, the researchers zeroed in on a part of the brain that, like the DMN in humans and monkeys, is only activated when the mind is at rest. So what does that mean? While it's conceivable that monkeys possess some form of introspective consciousness along the same lines as humans, it's a lot harder to believe that rats possess that sort of capacity for self-reflection. This could mean that the DMN has a more fundamental function, and it's only in humans (and some of our closest relatives) that the network has also become involved with consciousness. "[The rats could be] thinking about their past, mind wandering, and this kind of passive brain activity might be important for memory in the rat." "The DMN draws heavily on the medial temporal lobe and memory areas, and we recently found we can increase DMN connectivity with self-driven memory retrieval tasks...The activity in frontal areas [could suggest] the notion of a sense of self in the rat. I've got to believe it's different from humans but it's certainly provocative". Journal of Neuroscience via New Scientist. Image by Dawn Hzucek on Flickr.